The Girl Behind the Door by John Brooks chronicles a father’s experience from the adoption of his only child to her suicide in her teen years, including the exploration of the role of an attachment disorder. Editor’s Note: This book contains references to parenting practices that are counter to API’s Eight Principles of Parenting but they are not provided as advice, rather as facts as the author reflects back on his personal story. The author also includes ways he could have incorporated the Eight Principles more in his parenting role, as he reflects back on his adopted daughter’s life. API: Tell us about your book. In the fall of 2007, she accomplished her dream–she was accepted at prestigious Bennington College for the fall of 2008. She never made it. In January of that year, she took our car, drove to the Golden Gate Bridge and jumped. Her body was never recovered. The Girl Behind The Door is my search for answers to Casey’s suicide. Why did she do it? What did everyone–especially the professionals–miss? What could we have done differently? What could we share with other adoptive families? Through research and interviews with adoption and attachment experts, I learned about the attachment issues and disorders that burden so many adopted children and result in the behaviors we saw in Casey. It explained everything about her. 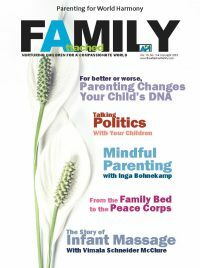 I share with the reader everything I learned about parenting and therapy techniques that have proven effective in helping orphaned children cope with the lasting effects of birth trauma, abandonment and emotional deprivation. There are numerous books on adoption and attachment from a clinical perspective. Other personal adoption stories seemingly end with wheels up from Moscow or Beijing, implying that the heavy lifting is over when it has only just begun. The Girl Behind The Door integrates a tragic personal adoption story with information from the experts to teach other families what we learned too late. API: What inspired you to write the book? John: I think that many parents who’ve lost a child feel compelled to do something to give their life meaning. Parents join grief and advocacy groups, and lobby for new laws to protect others from tragedy, among other things. I’ve joined the fight to install a suicide barrier on the Golden Gate Bridge–the deadliest structure on Earth for suicide. But my journey led me beyond the bridge to determine what led Casey there in the first place. So I wrote a book. API: How will this book benefit other families? John: Much more is known today about the effects of abandonment and adoption than was known in 1991, before researchers had an opportunity to study the long-term effects of deprivation on Romanian orphans. Today attachment resources and therapists are still difficult to find, even in big cities. Many therapists are still unschooled in specialized attachment therapies and treat adopted children as they would any other children. While I don’t claim to have uncovered every attachment resource (see my Resources section), I’ve found many that readers can use as a starting point for their own journey in trying to get help for themselves and their children. I’m not a professional, and I don’t diagnose or dispense advice. But by raising awareness to the challenges that adoptive families face even today, I hope to make a difference. API: Is there any special message you have for parents of children with attachment disorders? 1. Prospective adoptive parents need to be thoroughly schooled by a qualified professional before they get on that plane or head for the delivery room. In all likelihood, that schooling will not come from the adoption agency or facilitator. Even better, these parents should meet adopted adults and hear about their life experiences. 2. Have your child tested and diagnosed by a qualified professional [if you suspect problems]. All too often, attachment disorder or reactive attachment disorder are convenient catch-alls when other disorders may be at work and difficult for the untrained eye to differentiate, such as attention deficit disorder, attention deficit hyperactivity disorder, fetal alcohol syndrome, Asberger’s syndrome and autism. If your child isn’t properly diagnosed, he or she can’t be properly treated. 3. It is absolutely vital to find the right kind of help. A qualified adoption therapist knows what questions to ask and how to ask them. 4. Be prepared for the kind of parenting and family experiences that may not be comfortable for you but are necessary for your child’s well-being. API: What are your views of Attachment Parenting International and what API is doing? How does your book work within our mission statement? John: I think that API and the support and practices it promotes for families are exactly what is needed for the adoption community. Not only are its resources invaluable, but providing a sense of community is very important for parents (like us) who often feel beaten, desperate and utterly alone. That sense of belonging to others with a shared experience is a powerful coping tool. API: Is there anything else you’d like to share? John: I think the book makes clear that, despite our difficulties, Casey meant everything to us. She was our entire world. And despite her tragic loss and the shards of our broken family left behind, I feel like the luckiest guy in the world to have been Casey’s dad. I could never imagine a more magnificent daughter. API: Where can people find more information about your book or your work? John: Readers can visit my website www.parentingandattachment.com. A limited number of books are also available for purchase in the API Store.